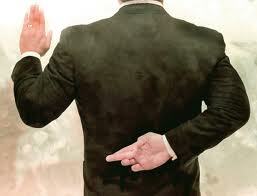 First, know this: if a politician tells you the jury is still out on man-made climate change, he's lying. The notion that some (not nearly all) scientists want to mix it up a bit and push back on political aggressors is unmistakable progress. But here's the simple truth in politics and PR these days: If you're waiting for something to say something untrue about you or your work before you decide to speak, you're waiting too long. So what should scientists do now? Simple - strike FIRST. Define the lie. Do it in a political context. One of the things they could do is hold a press conference in DC before the new Congress is seated and let the political reporters know some basic facts. Not necessarily the science of climate change, because most political reporters don't care about the science of climate change. The basic facts I'm talking about can be summed up thusly: if a politician tells you the jury is still out on man-made climate change, he's lying. Get out there first and define the lie. Yes, it's been said before. But not really in this context - right as a session of Congress is beginning. Make sure everyone knows they're lying - make sure it's the default position. Then let the media investigate the motivation behind the lie. Then follow up the press conference with editorial board meetings with the newspapers in key Congressional districts (i.e., the members of Congress who chair relevant committees), again with the simple, clear message: if a politician tells you the jury is still out on man-made climate change, he's lying. Then take the most noteworthy climate scientists in particular states where members of Congress are beholden to those who might see value in obfuscating climate science and have them deliver a clear, simple message to the media there: if a politician tells you the jury is still out on man-made climate change, he's lying. Do it first. Do it NOW. Do it again and again and again. Have the scientific details available in a hand-out for anyone who asks, but keep the message clear and simple. Yes, it's been done before, but not like this. Hey, politics is inherently uncomfortable, regardless of the level of "civility," but leave no doubt about what's the truth and what's a lie. If a politician tells you the jury is still out on man-made climate change, he's lying. I can't figure out if this is a joke... or you're serious? CO2 levels rose roughly the same during the first half of the 20th century as they did the last half. For some reason, there's no explanation for the first 50 years, but certainty that "man" must have caused the rise in the last 50 years. I quote from Mark Steyn: "But these days "environmentalism" is mostly unrelated to the environment: It's a cult, and, like most cults, heavy on ostentatious displays of self-denial, perfectly encapsulated by the time-consuming rituals of "recycling," an activity of no discernible benefit other than as a communal profession of faith." Reasonable measures to protect the environment is one thing; taking us back to the pre-fire days is something most Americans will not abide. And face it, that seems to be the only way the Greens would be happy. Cold, but happy. And is the John Abraham source the associate professor at the "never before heard of" University of St. Thomas in Minnesota, who happens to teach engineering? How would anyone in Minnesota know about global warming? And wouldn't they welcome it? I'll say it again. If a politician tells you the jury is still out on man-made climate change, he's lying. The facts are unmistakably clear. Climate change is happening, man's activities are contributing to it, and the consequences are measurable. That's the clear scientific consensus. if you want to be taken seriously here you should a) stop being anonymous and b) stop arguing against things I haven't asserted. The "environmentalism is a cult" argument is silly, it's ad hominem, and your source is a humorist/pundit. Right. Anyone who disagrees with you MUST be a liar. There is no other explanation, right? It couldn't possibly have anything to do with the fact that politicians in general don't know any more about science than the people who vote for them. It must be malice. It couldn't be that it's a complex issue which is difficult to sort out even if you're a scientist, let alone a layman. No, the more logical answer is that they're liars who would gladly destroy the world for personal benefit. again, anonymous. and again, the scientific consensus is overwhelming - even if you don't understand it or don't like it. and yes, they're lying. sorry, you just have to do better than that. I know very little about the science behind it all. Most laymen will get lost in the details, and so belief in one side or another is usually a matter of faith. I do know, however, that there are enormous profits on the line for those on one side of the issue. And where such profits are involved, truth is usually secondary, and is often the enemy. It's just that the climate skeptics look so transparently like damage control for the energy industry. Hello. This post is likeable, and your blog is very interesting, congratulations :-). I will add in my blogroll =). If possible gives a last there on my blog, it is about the Generic Cialis, I hope you enjoy. The address is http://onlinehealthtip.blogspot.com/. A hug. The situation of the environment today is undeniably too severe to be restored. The least thing people can do is to to promote sustainability. Straighten your posture at spinal decompression plantation FL today!